"Dose-response" redirects here. For the academic journal, see Dose–Response. Semi-log plots of two agonists with different Kd; the blue curve indicates a more potent agonist than the green curve (higher response for the same dose). The dose–response relationship, or exposure–response relationship, describes the change in effect on an organism caused by differing levels of exposure (or doses) to a stressor (usually a chemical) after a certain exposure time. This may apply to individuals (e.g. : a small amount has no significant effect, a large amount is fatal), or to populations (e.g. : how many people or organisms are affected at different levels of exposure). Studying dose response, and developing dose–response models, is central to determining "safe" and "hazardous" levels and dosages for drugs, potential pollutants, and other substances to which humans or other organisms are exposed. These conclusions are often the basis for public policy. The U.S. Environmental Protection Agency has developed extensive guidance and reports on dose-response modeling and assessment, as well as software. Dose–response relationships generally depend on the exposure time and exposure route (e.g., inhalation, dietary intake); quantifying the response after a different exposure time or for a different route leads to a different relationship and possibly different conclusions on the effects of the stressor under consideration. This limitation is caused by the complexity of biological systems and the often unknown biological processes operating between the external exposure and the adverse cellular or tissue response. A dose–response curve is a simple X–Y graph relating the magnitude of a stressor (e.g. concentration of a pollutant, amount of a drug, temperature, intensity of radiation) to the response of the receptor (e.g. organism under study). The response may be a physiological or biochemical response, or even death (mortality), and thus can be counts (or proportion, e.g., mortality rate), ordered descriptive categories (e.g., severity of a lesion), or continuous measurements (e.g., blood pressure). A number of effects (or endpoints) can be studied, often at different organizational levels (e.g., population, whole animal, tissue, cell). The measured dose (usually in milligrams, micrograms, or grams per kilogram of body-weight for oral exposures or milligrams per cubic meter of ambient air for inhalation exposures) is generally plotted on the X axis and the response is plotted on the Y axis. Other dose units include moles per body-weight, moles per animal, and for dermal exposure, moles per square centimeter. In some cases, it is the logarithm of the dose that is plotted on the X axis, and in such cases the curve is typically sigmoidal, with the steepest portion in the middle. Biologically based models using dose are preferred over the use of log(dose) because the latter can visually imply a threshold dose when in fact there is none. The first point along the graph where a response above zero (or above the control response) is reached is usually referred to as a threshold-dose. For most beneficial or recreational drugs, the desired effects are found at doses slightly greater than the threshold dose. At higher doses, undesired side effects appear and grow stronger as the dose increases. The more potent a particular substance is, the steeper this curve will be. In quantitative situations, the Y-axis often is designated by percentages, which refer to the percentage of exposed individuals registering a standard response (which may be death, as in LD50). Such a curve is referred to as a quantal dose-response curve, distinguishing it from a graded dose-response curve, where response is continuous (either measured, or by judgment). 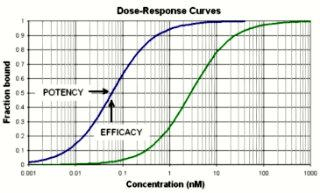 A commonly used dose-response curve is the EC50 curve, the half maximal effective concentration, where the EC50 point is defined as the inflection point of the curve. Statistical analysis of dose-response curves may be performed by regression methods such as the probit model or logit model, or other methods such as the Spearman-Karber method. Empirical models based on nonlinear regression are usually preferred over the use of some transformation of the data that linearizes the dose-response relationship. Dose–response curves are generally sigmoidal and monophasic and can be fit to a classical Hill equation. A generalized model for multiphasic cases has also been suggested. The concept of linear dose-response relationship, thresholds, and all-or-nothing responses may not apply to non-linear situations. A threshold model or linear no-threshold model may be more appropriate, depending on the circumstances. A recent critique of these models as they apply to endocrine disruptors argues for a substantial revision of testing and toxicological models at low doses. ↑ Crump, KS; Hoel, DG; Langley, CH; Peto, R (1976). "Fundamental carcinogenic processes and their implications for low dose risk assessment". Cancer Research. 36 (9 Part1): 2973–9. PMID 975067. ↑ Lockheed Martin (2009). Benchmark Dose Software (BMDS) Version 2.1 User's Manual Version 2.0 (PDF) (Draft ed.). Washington, DC: United States Environmental Protection Agency, Office of Environmental Information. ↑ Altshuler, B (1981). "Modeling of dose-response relationships". Environmental Health Perspectives. 42: 23–7. doi:10.1289/ehp.814223. PMC 1568781 . PMID 7333256. ↑ Hamilton, MA; Russo, RC; Thurston, RV (1977). "Trimmed Spearman-Karber method for estimating median lethal concentrations in toxicity bioassays". Environmental Science & Technology. 11 (7): 714–9. doi:10.1021/es60130a004. ↑ Bates, Douglas M.; Watts, Donald G. (1988). Nonlinear Regression Analysis and its Applications. Wiley. p. 365. ISBN 9780471816430. ↑ Vandenberg, LN; Colborn, T; Hayes, TB; Heindel, JJ; et al. (2012). "Hormones and endocrine-disrupting chemicals: Low-dose effects and nonmonotonic dose responses". Endocrine Reviews. 33 (3): 378–455. doi:10.1210/er.2011-1050. PMC 3365860 . PMID 22419778.